…For a post-Brexit Britain the challenge is abundantly clear. It is to make an urgent decision – I am surprised it has not already been made by this Government – to increase our defence spending from 2% to, at the very least, 2.5% and as soon as possible up to 3%. “There are three dangerous potential military crises on the international agenda: North Korean nuclear weapons; eastern Europe, focused on Ukraine; and the Middle East, focused on Syria. Any or all of these could bubble over into serious military conflict. “… Churchill did not say that jaw-jaw is better than war-war. He said: “Meeting jaw to jaw is better than war”, which is a far more toughly worded explanation of why we must always be open to negotiation while preparing for war. “… For a post-Brexit Britain the challenge is abundantly clear. It is to make an urgent decision – I am surprised it has not already been made by this Government – to increase our defence spending from 2% to, at the very least, 2.5% and as soon as possible up to 3%. “… It is up to us in Europe to demonstrate to the US that we will match its NATO commitment. On this Britain should take a lead, and urgently. 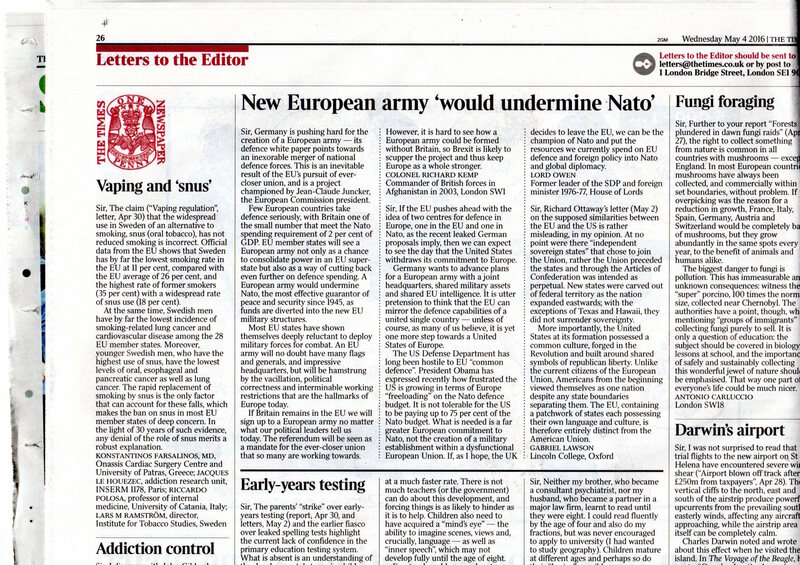 “… There is a strong case for considering the establishment of a NATO-EU permanent joint council—a PJC—of NATO non-EU members and NATO EU members. Lord Owen interviewed by Nick Ferrari on LBC this morning – Monday 9 April 2018 (full recording below). “Unlike in 2013 when Obama was not contemplating serious action (which I did not support), it now looks as if the US are serious and are not prepared to accept Assad continuing as the Syrian President in any peace. Russia will have to get used to this, and the UK and France should act with the Americans. The world faces a very grave situation over what to do to contain the Korean dictatorship of Kim Jong-un after the sixth and most powerful nuclear test in deﬁance of international law and progressively tougher UN resolutions passed unanimously with the support of China and Russia. This comes after a series of Korean missiles capable of carrying nuclear warheads were launched demonstrating to Japan and South Korea that they can be hit and promising the same would be done to the island of Guam in the Paciﬁc. Guam is an unincorporated US territory whose inhabitants are automatically US citizens and it has been a critical place for US defence ever since the war against Japan in 1941. The closest comparable threat to the US was during the night of the 26 October 1962 when Soviet troops in Cuba, ignoring President Kennedy’s earlier public demand for the removal of all Soviet missiles, moved three FKR missiles with 14 kiloton nuclear warheads, to within 15 miles of the US naval base at Guantanamo Bay. For that one night the Russians, without reference back to Moscow, had orders to ﬁre if the US invaded the island. The UK will not be asked in advance to approve any US action against North Korea but the UK was part of a UN force that the Labour Prime Minister, Clement Attlee, agreed should ﬁght in defence of South Korea in June 1950.
that the US would use atomic bombs north of the Yalu river in North Korea unless peace talks in Panmunjom between North and South Korea made rapid progress. In 2006 the deteriorating situation in North Korea was part of an “uncertain world too big a risk for our defence” that convinced another Labour Prime Minister, Tony Blair, to renew our UK nuclear deterrent. More recently some 170 Labour MPs supported that decision in Parliament, later conﬁrmed in Labour’s manifesto in the recent 2017 General Election. So Britain cannot wash its hands of the dilemma the US faces and disown any decision President Trump might make particularly if it emerges it had the support of the Chiefs of Staff and the Secretary of Defense, General James Mattis. President Trump has talked directly to the Chinese President Xi in person and by other means many times. If Chinese diplomacy cannot change the mind of the Korean leader what will short of force? Perhaps initially using the Massive Ordnance Air Blast bombs on all nuclear sites will suﬃce, leaving nuclear bombs as a last resort only if South Korea is attacked. These MOAB bombs (also known as Mother of All Bombs) were used for the ﬁrst time ever in April against an ISIS tunnel and cave complex in Afghanistan. It is an horrendous choice the US is facing. The EU is wisely, four months on since the UK referendum vote to leave the EU, less inclined to dismiss Brexit as an event of little significance, a matter just for the British. The EU is more likely now, in the wake of Brexit, to start to face long overdue reform…. Defining a core Eurozone involving a Fiscal Union and a Banking Union will have to be openly discussed, as already has been done informally by Germany and the Netherlands. Initially at least with Belgium and Austria. Even if something dire happens to the Eurozone these four countries will ensure that a small Eurozone continues. The question is who will be their partners? As for France, a lot will depend on the outcome of the French elections. But for the first time, whereas it would have been automatic in the past that Germany would insist on French membership, there may not be the level of public support after the elections in Germany to include France initially. It is very unlikely that German public opinion will accept any system of automatic money transfers to Italy…. Other countries that would want to be part of a core Eurozone are Spain and Ireland. Finland in the past would have expected to be a member; perhaps not now. Luxembourg will want to participate but they, Ireland, Cyprus and Malta, may need to face tax haven questions first as it is very undesirable that any unacceptable practices should be inherited by a new Fiscal and Banking Union….. The core Eurozone countries cannot throw a number of countries out of the Eurozone given the practical politics of the EU. What they can do is make them ineligible to be part of a core because of the way that core has fixed the initial criteria for a Fiscal and Banking Union. The weakest economies would become more vulnerable to speculative moves aimed at destabilising some of their economies, but if they can ride out speculation they might be able to stay in the Eurozone even though they were not protected as would be members of the core. Aware of their vulnerability and anticipating such speculation, some might prefer to leave rather than await being forced to decide to leave at a time of crisis. The best outcome would be if Italy voluntarily chose to leave the Eurozone for they would have the power to lead a serious restructuring of the EEA and ensure it was not unduly influenced by core Eurozone members. And others like Greece and Portugal might follow. A core Eurozone will not be a North-South Eurozone in the sense of a formal geographical divide, though this may be the appearance. A divide will happen because of the design and disciplines of the core. Some countries that stay in the Eurozone and make the transition will be able to qualify to be part of the Fiscal Union and Banking Union over time. In effect this core will become a federal Europe. … Besides Eurozone reform, there is the need to face up to President Obama’s criticism that Europe is “freeloading” within NATO and the disappointing record of the European External Action Service, EEAS. … Only in a revived NATO, where European countries are no longer as President Obama rightly accused us of being ‘freeloaders’, and we make a greater financial contribution, will Europe redress the imbalance between us and President Putin’s Russian Federation. If the UK leaves the EU, we can champion Nato and put the resources we currently spend on EU defence and foreign policy into Nato and global diplomacy. Letter to The Times, Wednesday 4 May 2016. Extracts: If the EU pushes ahead with the idea of two centres for defence in the EU, one in the EU and one in Nato, as the recent leaked German proposals imply, then we can expect to see the day that the United States withdraws its commitment to Europe. ….it is utter pretension to think that the EU can mirror the defence capabilities of a united single country – unless of course, as many of us believe, it is yet one more step towards a United States of Europe. …If, as I hope, the UK decides to leave the EU, we can be the champion of Nato and put the resources we currently spend on EU defence and foreign policy into Nato and global diplomacy.